Prince Lazar was born in 1329 in Prilepac to the aristocrat family Hrebeljanović. His father Pribac was a Logotet-secretary doing very confidential work for King Dušan the Powerful in the royal palace. Young Lazar was raised in the palace, and was respected by the King who entrusted him with the rule of two parts of his kingdom: Srem and Mačva. Lazar married Milica the daughter of an important aristocrat named Vratko also known as Yug Bogdan - a very wise and honorable man from the Nemanjic family. Lazar had three sons: Stevan, Vuk and Lazar and five daughters: Jelena, Mara, Despa, Vukosava and Mileva. King Dušan the Powerful died unexpectantly in 1355 at the age of 48. This led to a weakening of Serbia's central government. Many dukes used this opportunity to secede from the Kingdom with the land that had been entrusted to them. The young son of Dušan Uroš took over the throne and soon was killed. Vukašin Mrnjavčević proclaimed himself the King of Serbia. 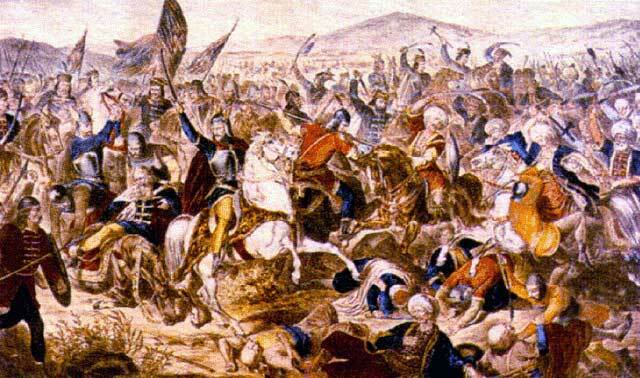 At this time, Turks were advancing toward the Kingdom of Serbia. In a battle on the river Marica in 1371, Vukašin was killed leaving behind him a weakened, poor and torn Serbia. Serbia was in desperate need of a gifted statesman, rich in virtue and deserving of God's Grace: a man similar to St. Sava and his father St. Stefan Nemanja who had founded the Serbian state. The Church recognized just such a man in Prince Lazar. His talent for leadership, wisdom and experience lifted him above those who would seize the throne by force and sought their own glory and importance. At this time, the Serbian Orthodox Church was in a dispute with the Patriarch of Constantinople. 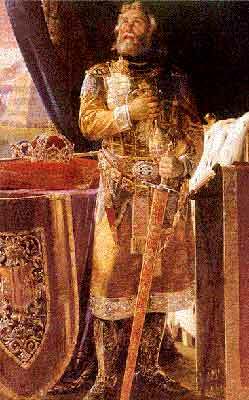 King Dušan the Powerful wanted Serbia to have an independent Church. He single-handedly sought to elevate the Serbian archbishop to the level of a patriarch. The Patriarch of Constantinople utterly rejected this act and broke relations with the Church in Serbia. This was a very serious problem and one which King Lazar managed to solve by reconciling the Serbian Church and that of Constantinople. It was a result of this reconciliation that gave the Serbian Church its first canonical Patriarch. Prince Lazar knew that his chances against the Turkish aggressor were small and on the eve of the Battle of Kosovo he gathered his upper aristocracy and asked if they should fight for the Holy cross and Golden Freedom or surrender to their adversaries and live as slaves of the Muslims. They had to chose between the Heavenly Kingdom and earthly one. In the true spirit of Christianity they preferred to place their hope in Christ and Eternal Life. The Prince and all of this warriors took Holy communion and went into battle on Saint Vitus Day, Tuesday June 15th 1389. 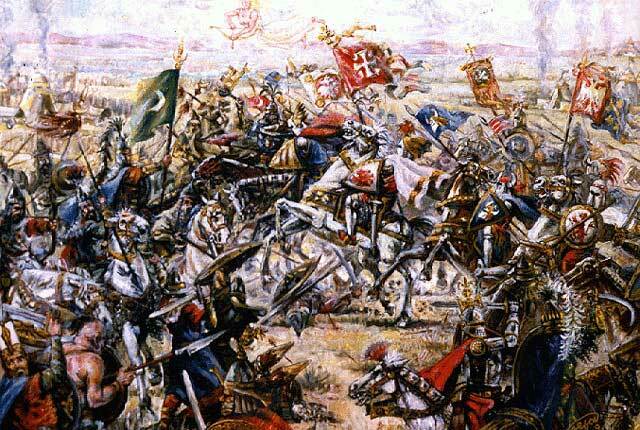 In the beginning of the battle Serbian warriors were able to advance. Miloš Obilić, the most famous hero of this Kosovo Battle, killed the Turkish King Murad. Despite this unexpected development, the Turkish army re-grouped and over ran the Serbs. They captured Prince Lazar alive, but beheaded him shortly thereafter.